Albert Boscov opened the largest of his department stores in Schuylkill County in August 1974. It had been planned to be opened for several years but first tons of earth had to be moved to flatten out the area that would be home to the Fairlane Village Mall and its enormous parking lot. When the earth was being moved a coal vein was discovered and removal of the coal held up the completion of the mall even longer. Finally, on Tuesday August 12th, a few days after Richard Nixon resigned the presidency, Boscov’s Department Store officially opened in Schuylkill County with a gala ribbon-cutting ceremony featuring a long ribbon of one hundred dollar bills which would benefit local charities. Al Boscov was short in stature but extremely large in his charitable giving. Community leaders such as St. Clair Mayor Joseph Long and state Senator Frederick Hobbs were on hand for the grand opening, as was Winter Carnival Queen Peggy Cevelesky. The first store manager, Thomas Jacobs was placed in charge of the approximately 300 employees. Al Boscov was also a showman and he brought the shopping experience to a new level not found in Schuylkill County at the time. 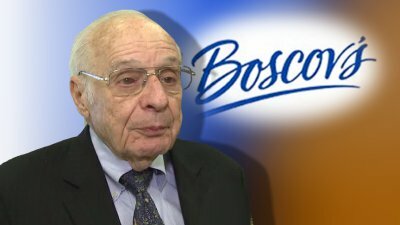 While Pottsville had been home to several department stores for many decades, none was as connected with its owner as Al Boscov with his privately owned chain of stores. In the later part of the 19th century, a department store was opened in Reading the county seat of neighboring Berks County by George Strickland Pomeroy, who partnered with Josiah Dives and John Stewart founded Dives, Pomeroy & Stewart in Reading. Several years later they purchased the historical R.R. Morris building at the northeast corner of Mahantongo and Centre Streets in Pottsville, with its department store named Dives, Pomeroy & Stewart. Stewart, who was married to George Pomeroy’s sister, had already left the business in 1883. Mr. Josiah Dives died in 1922 and the following year the stores would be renamed as Pomeroy’s operated by George S. Pomeroy and his son, George, Jr. (marketing a name like Dive’s would have been a harder sell, I think). Soon Pomeroy’s would become the largest and most popular department store in the county. By the late 1960s downtowns across America began to suffer from the urban flight to the suburbs and shopping malls. The Fairlane Village Mall (named after a Ford automobile sold by the Seitzinger Brothers who developed the Mall on their land) would soon become the premier shopping area in the county with Al Boscov’s store, it’s main attraction. The new department store brought employment to approximately 300 people, including Norman Aggon who managed the men’s department, Angie Pellegrino, girls’ and misses department, Jim Carroll, of St. Clair, the toy department, Arlene Kostura, head cashier, David Nye, shipping. While the store featured nostalgic mining decor in the boys department, Boscov’s imitated the glamorous big city department stores by featuring in-house fashion shows in its upstairs community room under the direction of Mary Lou Morrow. Paul Mazzotta would become the director of Boscov’s Hair Center. Al Boscov wanted shopping in his store to be an experience that would lure a customer back on a daily basis. He was a success and his name would eventually become a verb. Did you Boscov today? Albert Robert Boscov died on February 10, 2017 at the age of 87 in his native Reading. Sources “Shop Pomeroy’s First” by Michael J. Lisicky; Pottsville Republican, Shenandoah Evening Herald August 12, 1974.